I love you, Jesus, but I don't always like you. The idea of you, yes. What you stood for, yes. But when I think about you as a man, human, person -- a (sorta) regular Joe -- my imagination fails me. And that makes me not like you. Because I'm challenged to understand how you could be in the world but not of it. And I'm annoyed that you managed to do it quite well. The truth is, acknowledging you as human puts too much pressure on me. Because you somehow escaped the human condition despite being fully human, and I didn't. So why compare? Why try? I'm already in your dust. I mean, you could have called 12,000 legions of angels to your side -- but you didn't. You could have cowed people as you traveled -- but you didn't. You could have set everything on fire and turned people in pillars of salt left and right -- but you didn't. Let's be serious: I just don't have that level of self-control. Or compassion. Or humility. End of story. 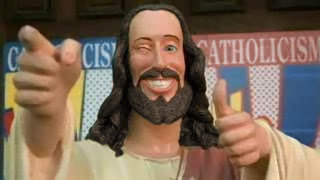 And you, Jesus, are a goody two-shoes. There. I said it. And fully human goody two-shoes usually end up with wedgies. But since I can't give you a wedgie, I'm going to be stubborn instead. I'm not going to apologize, I'm not going to listen, and I'm especially not going to ask for your help. I won't give you that satisfaction. So there. Take THAT. I think it's a good plan. There's no way it can backfire. Victory is mine, Jesus. Victory is mine.